He might have run 600m indoors quicker than any other Briton ever has, but Kyle Langford insists he could have gone even faster in Athlone earlier this month. The 21-year-old clocked 1:16.10 at the AIT International Grand Prix on February 15 to improve on Dai Greene’s time of 1:16.22 from 2013. That came after a below-par performance at the British Athletics Indoor Team Trials in Sheffield, where he finished fifth over 800m. Following his record-breaking run in Ireland, Langford went on to place third at the Müller Indoor Grand Prix, running an indoor PB of 1:46.79 for third. What makes his performance all the more impressive is that before this year, the European junior gold medallist hadn’t raced indoors since 2014, and even then that was to contest a sole 400m. 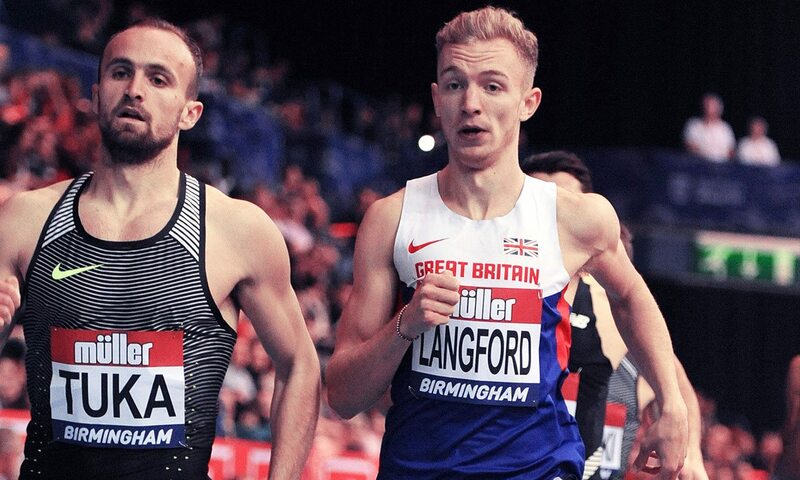 Although disappointed with his run in Sheffield, Langford – who has since been selected for GB’s European Indoor Championships team – says the race served a positive purpose and made him even more motivated. “I felt physically fine but mentally, it was my first race and I think I went into it a bit raw,” he said. “I lost concentration and when you lose concentration indoors it’s really unforgiving. “I think it was a learning curve for me. I needed a bit of a kick up the a***. My main aim going into the indoor season was wanting to break the 600m record. Having struggled with injury last year, the Shaftesbury Barnet athlete says he is now taking things more seriously and changes to his training programme, including the introduction of strength and conditioning, have made a big difference. Langford is enjoying racing again and that is being reflected in his performances. Having competed at the IAAF World Championships in Beijing two years ago, one particular moment Langford hopes to enjoy this summer is reaching the final when the championships take place in London. “All in my mind is that I want to make the final at Worlds,” he said. “I think making the final at Worlds is harder than winning a medal. Once you’re in a final any of the eight people can win a medal.